If not a masterpiece, “Transparent Music” is at least very close. This recording features BJ Cole's extraordinary facility on the steel guitar. In his hands, the instrument moves through an amazing spectrum of expression: gently calling, murmuring, whispering, weeping, then soaring and singing. Song selection on “Transparent Music” is classical (or neoclassical, if you prefer), and Cole manages to generate the scope of classical music, the grand sweep and the idea that a beautiful song is a force of nature; a manifestation of the universe. Most compelling are his interpretations of Ravel and Debussy, rendered with real vision and feeling with an instrument typically thought of as limited to Country & Western. Debussy's already glorious “Claire De Lune” hasn't sounded this sensitive and atmospheric since Isao Tomita's interpretation. Ravel's “Pavane Pour Une Enfante Defunte” (Pavane for a Dead Princess) is here rendered gracefully heartbreaking, and Cole's instrument lets out a sad cry that seems to remember every sweet gesture of the lost child. Accompanying instrumentation is much influenced by musical masters Harold Budd and Brian Eno; appropriate guidance for anyone seeking to create a world of tenderness and hazy sunlight. Music with many of these qualities is often categorized as “new age,” just one of several sections in record stores where you may find the CD. I've seen it stocked as “instrumental,” “meditative,” “classical” and so on. 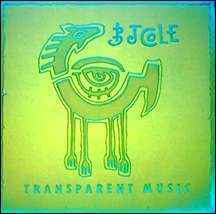 “Transparent Music” also features sensitive treatment of two Erik Satie pieces, and several original compositions by Cole and keyboardist Guy Jackson. Cole's chromatic palette is like that of painter Maxfield Parrish; it conjures up a vivid world bathed in a pearlescent, sunset glow. He exploits this quality of the steel guitar to great effect, and a few other qualities of the instrument and the recording studio we did not know existed. In that sense, “Transparent Music” is a ground-breaking recording; it not only does a beautiful job of re-interpreting well-known music and showcasing several new compositions, but it presents a new musical sound; a unique approach introduced by a gifted artist. Link to purchase site (new window) at Cole's official website or Amazon.com.